As I noted in my previous post, we are actively working to make Recovery Act awards. 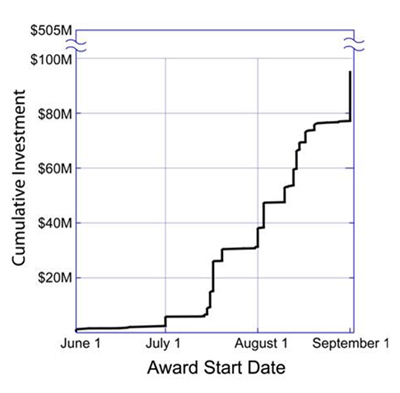 Below is a plot of the cumulative investment of NIGMS Recovery Act funds as a function of the award start date. This includes awards made through the middle of August. As you can see, the rate at which we are making awards is accelerating. Many more awards are in process. Our advisory council will review Challenge Grant, GO Grant, and Faculty Recruitment (P30) applications in mid-September, and we plan to make awards by the end of that month. Back in May, I described a concept clearance for a new grant program focused on microbe-host interactions. A number of readers commented on the post, and I was delighted to see the early interest in this new program, as well as other related programs at NIH. The RFA has now been published in the NIH Guide. We’re soliciting applications for projects that will reveal the basic principles and mechanisms that govern host-associated microbial community structure and function through studies in the following areas: model systems, community physiology, community genetic interactions, community dynamics, and technology development. Please note that research projects designed solely to carry out metagenomic sequencing or surveys of microbial diversity are outside the scope of this program. We plan to make 5-6 R01 awards totaling $2.5 million in fiscal year 2010. Letters of intent are due December 15, 2009, and applications are due by January 15, 2010. NIH has announced the 2010 competitions for the NIH Director’s Pioneer Awards and the NIH Director’s New Innovator Awards. These awards support exceptionally creative scientists who propose highly innovative—and often unconventional—approaches to major challenges in biomedical or behavioral research. Both programs are part of the NIH Roadmap for Medical Research and are managed by NIGMS. The Pioneer Award provides $2.5 million in direct costs over five years and is open to scientists at U.S. institutions at any career level. The deadline for applying is October 20, 2009. The New Innovator Award provides $1.5 million in direct costs over five years and is designed for early stage investigators at U.S. institutions who have not yet obtained an NIH R01 or similar grant. Applications are due by October 27, 2009. For more information about the programs and links to the requests for applications, see the Pioneer Award Web site and the New Innovator Award Web site. One of the features of these programs that I find most exciting is the annual symposium. This year’s symposium will take place on the NIH campus in Bethesda on September 24 and 25 and will include research talks by the first graduating class of Pioneer Award recipients and by the class of 2008. The 2009 award recipients will also be announced. 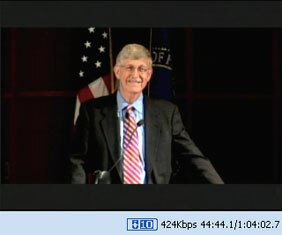 The symposium will be videocast live and archived at http://videocast.nih.gov. Since my last post about PSI:Biology, I’ve received lots of questions about the initiative and the new funding opportunities. To answer these questions more broadly and encourage more applicants, we’re hosting a live videocast briefing on Monday, August 31, from 2:30 to 4:30 p.m. EDT. You’ll hear from Jeremy Berg, Cathy Lewis and myself. Participants will have the chance to ask questions, make comments, get input on possible research projects and identify potential collaborators. You can use the live event feedback form on the videocast page, or you can send your questions in advance by e-mailing me or posting a comment here. If you would like to remain anonymous, please be sure to let us know so we don’t share your name during the briefing. 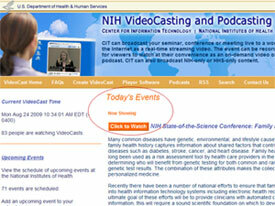 To watch the live event, go to http://videocast.nih.gov next Monday and look for “PSI: Biology VideoCast Briefing” in the “Today’s Events” section. Later, you’ll be able to find the archived version of the briefing on the past events page. A number of you have wondered if NIGMS can help you identify other researchers with whom you might collaborate to develop an application to establish one of the PSI:Biology partnerships. In response, we’ve established a Web form that will allow you to enter your name and contact information and a brief description of the research area for which you would like to apply. Participation is entirely up to you and is not a requirement for application. The form and the public page with submissions will be posted until the application deadline. This brings me to my final update: We have extended the due dates for submitting letters of intent and applications. They are now September 28, 2009, and October 28, 2009, respectively. UPDATE: We just issued an NIH Guide notice that includes some additional information. On Monday, Francis S. Collins, M.D., Ph.D., became the 16th director of the National Institutes of Health. He was nominated by President Obama on July 8 and unanimously confirmed by the U.S. Senate on August 7. Dr. Collins is well known in the scientific community and is very knowledgeable about NIH at all levels, serving as the director of the National Human Genome Research Institute from 1993-2008 and being a productive intramural investigator. NIH issued a news release with more biographical information. Shortly after being sworn in, Dr. Collins held a town hall meeting with NIH staff. In his remarks, he eloquently outlined his vision and priorities, which include securing stable funding for biomedical research, training the next generation of scientists and nurturing early stage investigators. I had my first opportunity to work closely with Dr. Collins soon after I came to NIH in 2003. It was in the context of the Molecular Libraries Initiative of the NIH Roadmap for Medical Research, which includes the PubChem database. As a chemist, I was very interested in the initiative’s potential for building new linkages between chemistry and biomedical research. In these and other interactions, Dr. Collins impressed me with his passion for principles, strategic thinking and careful preparation. I share the sense of excitement and optimism he expressed at the town hall meeting regarding the opportunities that lie ahead. I encourage you to watch the hour-long video of the town hall event. The trans-NIH Biomedical Information Science and Technology Initiative (BISTI) funds a range of projects that advance computer science and technology to address problems in biology and medicine. BISTI, which is led by NIGMS, has just reissued four broad-based program announcements to support “innovations in biomedical computing.” In the past, BISTI has awarded 198 of these grants ranging from $200,000 to $3 million. The announcements cover traditional research projects; exploratory, high-risk/high-impact projects; small business innovation research; and small business technology transfer grants. They apply to most areas of NIH research, from basic to clinical, and require that more than 50 percent of the proposed research involve computing. For example, investigators can request funds for scientists and software personnel to develop models to analyze a disease, and they can also request funds to obtain data or perform experiments to validate the models. Again, in all cases the majority of effort should be on the computing side. If you want to significantly expand your computing efforts and capabilities, these funding announcements are a really great opportunity!